See our easy tips for growing acorn squash and other other winter squash when vegetable gardening! Free plans for planting, growing, harvesting, and storing winter squash in home vegetable gardens. There is something tasty for everyone in the vast winter squash clan! Planting acorn squash that is produced on vigorous vines, requires considerable space as well as a long growing season. 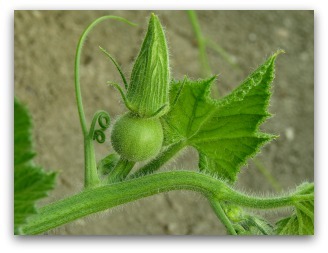 As one of the smaller squash varieties, the fruit is named for its shape. 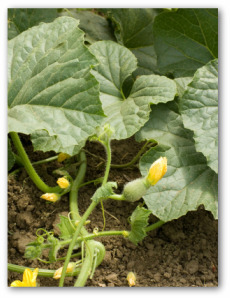 Plant this winter vining squash variety at one end of your vegetable garden. Contrary to what its name suggests, winter squashes are warm-seasoned crops and are extremely sensitive to cold and frost. 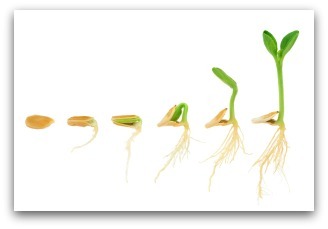 Avoid planting the seeds until the soil has warmed. Direct seeding is the best method for growing winter squash. If you are cultivating a variety that that requires a longer growing season than your area can provide, use healthy transplants to get a head start on the growing time. Plant acorn squash in early spring to early summer depending on your climate. A soil pH of 6.5 is recommended for growing acorn squash. Leave a distance of 5 feet between hills and 6 feet separating hill-rows. Growing acorn squash is planted like pumpkins, using extra compost in the hills. Squashes prefer well-worked soil with good drainage. They are heavy feeders so the garden bed must be well- fertilized. Keep the ground evenly moist; the plants need plenty of water during hot weather. Vining types of growing acorn squash can be trained to climb up a fence or trellis to save space. The Early Acorn variety is ready in 75 days. It produces fruit with an orange flesh and smooth texture on a compact plant. The All America Selection acorn variety, Table King, has large fruit and is harvested in 75 days. The squash vine borer attacks bush and running squash varieties alike. Controls include mulching around the stem area. Dust or spray with insecticide at 10- day intervals beginning near the end of June in most Northern vegetable gardens. Check the directions for the sprays and dusts to note how near to harvest the product can be used. Growing acorn squash is ready for harvest in 80-100 days. Winter varieties such as acorn squash taste quite different from the summer squash varieties such as zucchini and yellow crook necks. Their sweet and nut-like flavor is best when the produce is fully ripened. Before the fruits are harvested, the rinds should be bone-hard. Many gardeners have trouble determining exactly when the time is right for harvesting. The best advice is to go by the color shown on the seed packet. 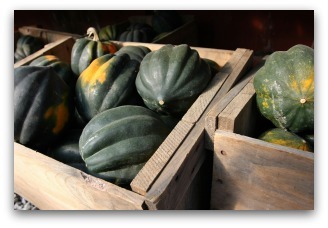 Winter squash must be harvested before frost threatens. From the soup course to dessert, the sweet, orange-colored flesh of winter squash is used in countless culinary dishes. Winter squashes such as acorn squash have been a staple among the "keeping" vegetables ever since Native Americans first introduced squash to the European settlers. For serving as a vegetable, prepare the small sized variety, Acorn squash, in halves or quarters. Remove the seeds from the sections. Scrape well to remove any stringy bits clinging to the surface. Bake them uncovered in a 350 to 400 degree F oven on a baking sheet for about 45 minutes to an hour. Test with a fork; when flesh is soft, the squash is ready to eat. 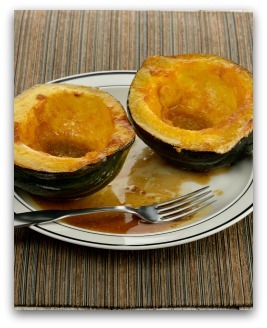 My mom always brushed on some melted butter and added a lump of brown sugar to the squash before baking. The result is quite delicious! Substitute cooked and mashed winter squash, freshly prepared or from the freezer, for pumpkin in your favorite recipe for pie filling. Acorn squash can also be used to replace the main ingredients, rutabagas and apples in the delicious dishes, Spiced Rutabagas and Apple Pie. Use 1-1/3 cups of squash, omit the applesauce, and increase the granulated sugar, depending upon your taste or preference. 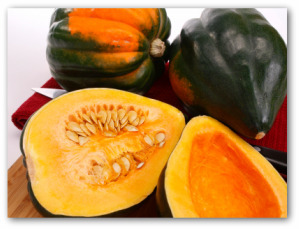 Acorn squash does not store properly unless they are vine-ripened. Use any bruised fruits beforehand, as they will spoil under storage conditions. Store acorn squash in a dry location at temperatures of about 50-60 degrees F.